In a Scottish sanitarium, a brilliant research psychiatrist works on a treatment for dementia precox. He falls for his altruistic female lab assistant and they begin a passionate tragic relationship. With a running time of less than half of that of Oliver Stone's also excellent "JFK," this movie is more to the point. It doesn't bombard you as much with facts/theories as "JFK," leaving some to the imagination of the viewer. It was released in the fall of 1973, while the 10th anniversary of the assasination approached, and the Watergate scandal was in full swing. I was 13 when it came out, and the idea that there even could have been a conspiracy was frightening. Almost thirty years later, it still is, although with all the subsequent revelations and scandals in D. C., it does not suprise me anymore. The movie moves along rapidly, and the acting by the late trio of Landcaster Ryan, and Will Geer (grandpa Walton as a bad guy, I love it! )is excellent. This was Robert Ryan's last film. It was an excellent final cinema performance by one of Hollywood's most under-rated actors. One can tell were Oliver Stone got his inspiration to cutting back and forth between black-and-white and color sequences. In that respect, Executive Action was ahead of its time. For almost twenty years, it was THE movie on the assassination. 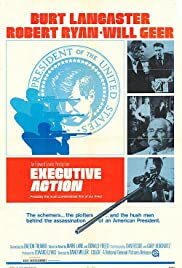 It is still an excellent companion piece to "JFK," and for those less interested in the subject this movie might actually be preferable, and it's theories are not dissimilar to Stone's. Unfortunately, the movie did not get it's due at the time of the release. At only ten years removed from the assasination, it was was still too painful a subject for many at the time. Finally, how Leonard Maltin finds this move "excruciatingly dull" is beyond me. 55 of 66 people found this review helpful. Was this review helpful to you?